Workers, local academics and civil rights leaders joined the community at the North Carolina Justice Center for a press conference on the importance of the Employee Free Choice Act and the freedom to bargain for a better life. 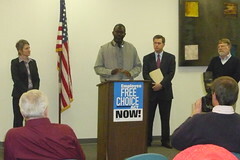 The gathering was a response to an anti-worker event by Americans for Prosperity to spread misinformation about the Employee Free Choice Act. Fred Hargrove speaks about positive experience with majority sign-up. In addition to giving workers the choice to join unions through the secret ballot or majority sign-up, the legislation places harsher penalties on employers who break the law and enables both employers and employees to seek the help of a mediator for the negotiation process.